There was once a little boy named Thomas. He grew up watching baseball with his dad and wanted to be a player when he got older. When he was old enough, his dad took him to Yankee Stadium where he saw his favorite Yankee players. Derek Jeter was his favorite one. "Oh that Jeter, he is awesome, right dad!?" Said Thomas. "Yes son, he is one of the greatest players today - and you see over there son?" says his dad as he points to monument park. "Derek Jeter's number 2 will be retired there some day and he will be up there with the Babe #3, The Iron Horse Gehrig #4, The Clipper DiMaggio #5, The Commerce Comet Mantle #7, Chairman of the Board Ford #16 and all the others." Thomas looks up at his dad with great joy and smiles. The game begins. Jeter is up at bat. Detroit's Verlander is on the mount. He pitches, Jeter swings. Jeter collects himself, gets ready for the next pitch. Jeter is calm as usual, Verlander pitches again. The pattern continues straight into the 7th inning. The Yankees are down by 7. Thomas is sad. The joy he had when he entered the House that Ruth built is no longer present. "What is it son? asks the dad. "What is wrong with Jeter? He is so good, he passed Gehrig's record for most hits. He is an awesome shortstop. But now he is just not hitting." Thomas complains. His dad looks at him and says, "he is just going through a slump, don't worry son." Thomas sighs. The Yankees catch up with 6 and Detroit has 7. It is the 9th inning and Jeter is up, there are 2 outs. Detroit's closer Valverde is on the mount. "Derek Jeter" and claping with rhyme: Clap clap clap-clap-clap. "Derek Jeter!" Clap clap clap-clap-clap. The crowd gets upset, some boo, but others continue to cheer for Jeter to get one of his "Jeterian hits." Jeter is down by 2 strikes, one more and the game is lost. Valverdi gets ready, checks first base and then pitches. Jeter looks and bammmm, he hit the ball. Jeter drops the bat and begins to run towards first base, but the ball is caught by Peralta and that's it. Game over! Thomas slams his glove and shouts, "I give up! I hate this! 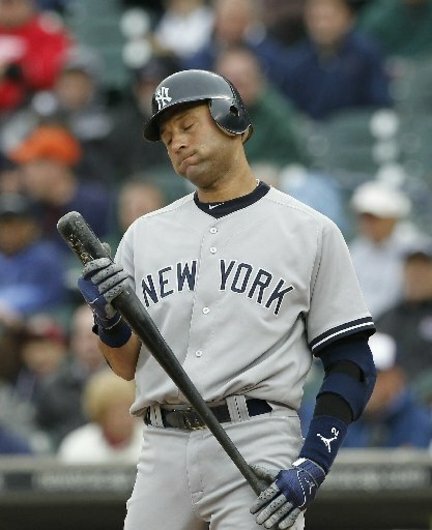 Jeter is no good. I hate baseball. Jeter's poor playing ruined it for me dad! I don't want to watch or play baseball again." His dad looks at him with a smile of concern. "Relax Thomas, this is just one game and Jeter is just one player. He is in a slump and will come around. You can't bring down baseball just for the bad performance of one player." This is a story I just made up - a modern parable if you will. Thomas is named as such for "doubting Thomas" of the Gospels. The moral of this story is that one bad player does not bring down the game of baseball. Baseball has a lot of great history and many great players. Similarly, one bad priest, one bad nun, one bad lay person or just one misbehaving Christian or person of faith does not bring down or tarnish the Catholic Church or any religion. Don't be like Thomas and doubt. Never give up! One bad idea in the minds of many people can be found quite terrifying and destructive though..